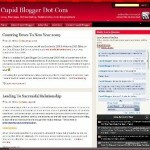 Cupid Blogger Dot Com will have top blog post from last month based on page views and number of comments on a monthly basis. This is for our readers who missed out all these great post last month. Here is a quick digest of the top post that you may want to check it out. In order not to missed any interesting blog post, make sure that you guys subscribe to the RSS feed or subscribe via Email. Tipsgoda’s last blog post..Are You Ready To Go On A Hot Date?